Teaching your students to take notes can be a daunting task. However, teaching students to take Doodle Notes is not only a more natural process for students, but it is also an activity with instant engagements. Children love to doodle, and unlike many adults, they don't let artistic ability (or lack of) hold them back. They don't worry about creating a perfect drawing and just focus on conveying an idea, which is the primary purpose of Doodle Notes. According to Allan Piavio, verbal information (words) and nonverbal information (images) are stored separately in long-term memory. The process of taking Doodle Notes activates both of these channels, which creates a network of understanding between words, concepts, and images. Because Doodle Notes engage the whole brain, even your most distractable students are better able to concentrate. The process of creating visuals for verbal data leaves little room for distraction. When students take Doodle Notes, they build a visual mental map of an idea or concept. This skeletal understanding allows students to organize and recall essential details with ease and retention improves dramatically. A simple doodle can capture the essence of a complex idea much faster than taking traditional notes. The is especially beneficial for students when they are presented with ideas in real-time (e.g., a class lecture, watching a film/presentation, etc.). 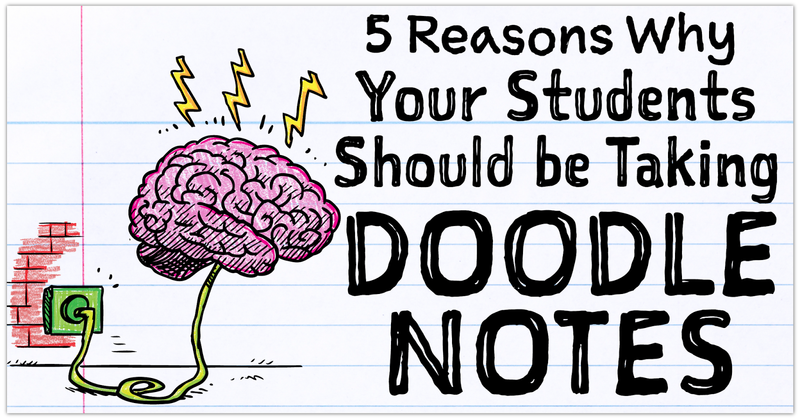 Since Doodle Notes allow students to "let go" of the details, notetaking becomes a lot less stressful. Your students will be free to focus on themes and big ideas while having fun doodling. Ready to give Doodle Notes a try? Here are a few resources to get you started.